In these challenging economic times were all trying to save wherever we can. But saving doesn’t have to mean cutting back or compromising on the quality of the coffee you drink. In fact quite the opposite — change can sometimes bring nice surprises like better flavour. It just means buying and consuming our products differently. 2 lb. of fresh roasted beans delivered to your home or office will make about 100 (6 oz. 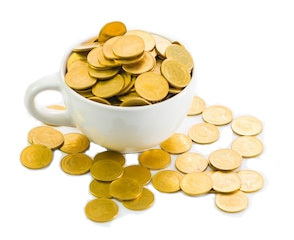 cups) of coffee at an average cost of about 35 cents a cup. That same 100 cups of coffee purchased in-store will cost an average of about $200.00 or about $2.00 per cup. Thats a savings of $165.00. The average coffee drinker consumes 1 lb. of fresh roasted beans every 2 weeks. Thats a saving of $165.00 every month or a staggering $1,980.00 every year. Now if you’re like us and consume 1 lb. of coffee a week you can double your savings to $3,960.00/year. The really amazing thing about Hockley Valley Coffee™ is that you’re guaranteed to receive a fresher, more flavorful coffee experience while saving money. Email us and tell us what you are going to do with your coffee savings… here’s a sample of what we have received so far.